Archimedes. 287 - 212 BC. We often see a bubbles of air floating up in water. Mercury, is a heavy liquid and if you drop a piece of iron into it, we see the iron float. Air has weight, however there are a few gases even lighter and they will float in air..
All these examples behave according to what we call "Archimedes Principle"
Archimedes was killed during the massacre that followed the capture of Syracuse (now in Sicily), by the Roman general Marcellus in 212 BC, even though Marcellus had given orders that he was not to be harmed. 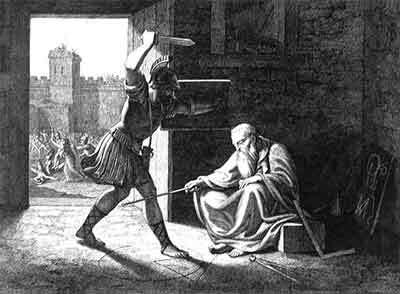 According to one story, in the midst of the general mayhem a Roman soldier came upon an old man drawing diagrams in the sand, and ran him through. Marcellus was distraught at the news, and saw to it that Archimedes was given a burial in accordance with his wishes, including a monument featuring a stone sphere and cylinder. This had been Archimedes' wish, because he regarded his discoveries on the volumes and surface areas of these solids as his most important - and most beautiful - achievements. Although this monument to one of history's greatest scientists was neglected and forgotten, his many mathematical discoveries live on. De Lana' vacuum balloons idea. 1670. From this he deduced that the empty container could produce lift. He thought this could be the basis for a ship which could float in the air. 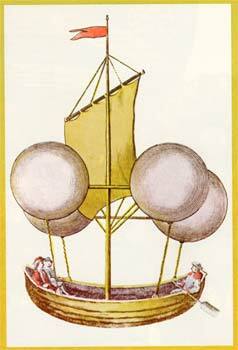 He designed this boat suspended from 4 thin copper spheres, each about 6.1 metres (20ft) in diameter. The theory was correct, although impractical, the thin spheres would be crushed by air pressure. Rather than construct strong heavy containers, we fill light fabric balloons with a light gas so the pressure inside and out is balanced. No matter how light these gases, they do weigh something, and must be included in any design calculations. De Gusmau and his flying model. 1709. In Brazil, Bartolomeu de Gusmao was inspired with the idea of flight. He made a number of model hot-air balloons from paper. 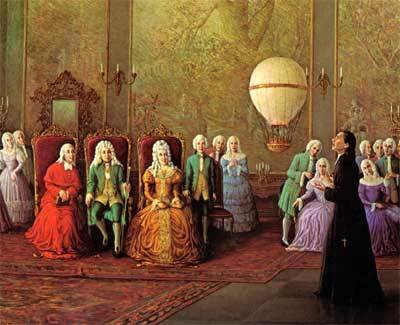 Here he is demonstrating a successful indoor flight in front of the King and Queen of Portugal in 1709. The small bowl hanging below contained burning material, probably paper. Even though the balloon set fire to the curtains and some of the furniture, the King and Queen were greatly impressed. 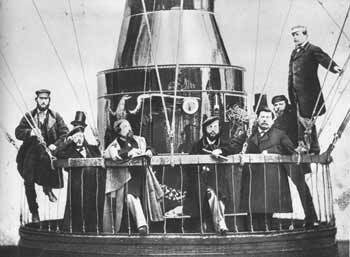 This is the first known demonstration of a hot-air balloon in history. Mongolfier's first manned flight. 1782. Joseph and Jaques Montgolfier were sons of a paper manufacturer in France. It is said that while hanging a shirt over a fire to dry, they noticed it swelling and filling with warm air. In 1782 they made a number of small paper balloons, filling them with hot-air by holding a flame under the open mouth. Successful flights indoors were followed by outdoor tests with ever larger models. Word spread of their success, and the French Royal Academy of Sciences requested further experiments. They went up on several tethered flights, then sent some animals up on free flights. After this, a balloon 70 ft high and 46 ft in diameter was built, it's capacity was 60,000 cu ft.
Ropes connected to the two poles shown were used to haul the empty balloon upright and hold it there while it was initially filled with smoke and hot-air. The neck was fitted with a light iron grating, and a gallery circled the open neck, for the passengers. 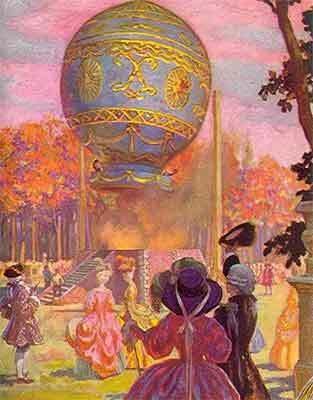 So, at Annonay in 1783, in front of the Royal Court, the first free flight in history, was made by Pilatre de Rozier & the Marquis d'Arlandes in a Montgolfier Balloon. To maintain balance, the two aeronauts stayed at opposite sides of the gallery. The base platform held the fire and for the balloon to keep flying, a supply of straw and cotton were kept on the gallery and thrown through an opening onto the iron grating and burnt. Sometimes little fires would start in the paper envelope, and wet sponges on sticks were used to put them out. 80 years later a huge balloon "The Eagle" was built. This shows the gondola. 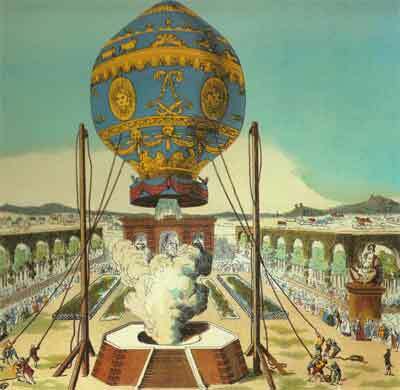 It is a hot-air balloon with a similar layout to Montgolfiers'. It was used in 1862 during the US Civil War for observation purposes. There's the circular gallery, there's straw being thrown into an open door to a firebox. The base and a chimney are safer, being made of light metal to reduce the chance of a fire. 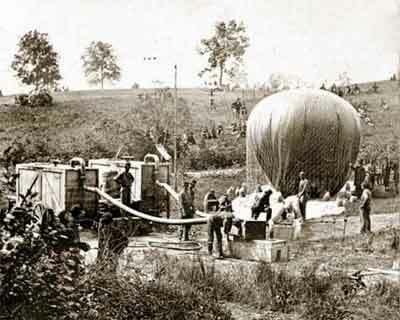 Here is a hydrogen balloon being filled during the same American Civil War, around 1860. Because hydrogen lifts so well, the balloon is relatively small. It is being inflated in a gully- away from the wind and enemy fire. Pipes can be seen leading from two large containers. Sulphuric acid was poured onto iron in these containers producing hydrogen gas. Acid then had to be filtered out of the hydrogen. 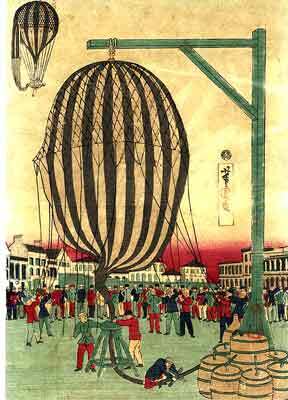 Interest in ballooning was not confined to Europe and this 1874 Japanese woodcut depicts a gas balloon being prepared for flight. Chemicals in the barrels produce the hydrogen, and it appears that the flow of gas is being regulated by a type of clamp. There is no sign of a basket in this view, however in the distance a flying balloon has a basket for passengers, as well as what appears to be an already deployed emergency parachute. 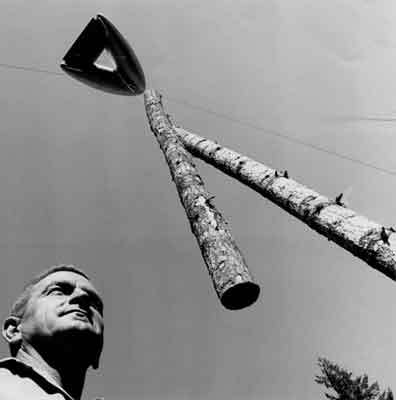 Below, we see two large, helium filled balloons for lifting forest logs. Such a system is often used in environmentally sensitive areas to avoid dragging along the ground, or damaging steep slopes. On the right is a more aerodynamic 'V' balloon. An aerial cable keeps the logs above the forest as they are dragged clear. Most of the balloons you see these days are for sport or tourism, and they use hot air, such as those here at Canowindra in country N.S.W. Balloons and Airships are often referred to as"Lighter than Air" craft. If you've ever helped launch a balloon, and dragged the various bits around, you might wonder about that term. 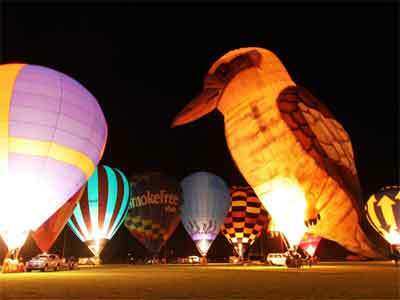 Hot Air balloons are easily recognised by the open mouth at the bottom, directly over a powerful gas burner. The heated air inside expands. This means it is less dense than the surrounding air, and can provide lift. Hot Air may not have as much lift as hydrogen or helium, but then you don't have to carry it with you. 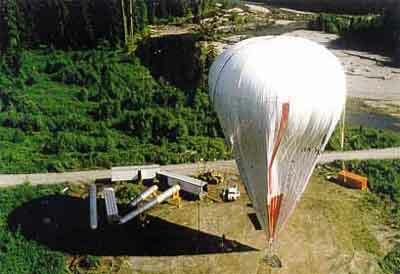 When a gas balloon lands, there is no practical way to recover the gas so, expensive as it is, it is released into the atmosphere. Some Basics for Balloon Design. Hydrogen gas gives the most lift, but it burns easily. Helium lifts well, it doesn't burn, however it is expensive. Hot Air may not have nearly as much lift as hydrogen or helium, but then you don't have to carry it with you. For that we need to calculate the volume. 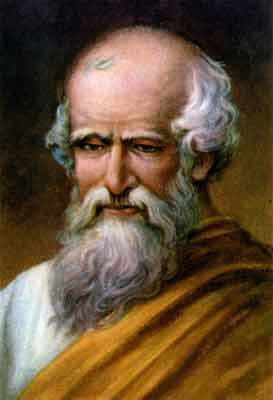 It was Archimedes, who discovered the fixed relationship between the diameter of a circle and its circumference. This ratio he called pi and used the Greek letter π to signify it. Applying these formulae to a 10 foot diameter Balloon. Suppose a balloon is 10 foot in diameter. Then the balloon's volume would be 4,190 cubic feet. The balloon would displace about 245 pounds of air. The balloon's fabric area would be 1,257 square feet. That means roughly each litre will lift about 1 gram. This gives a Total Lift . (Easily forgotten is The Weight of the Lifting Gas. This gives a Total Load . To fly, the Lift should equal, preferably exceed, the Load.